It allows you to send files during a conferencing directly without using third-party solutions. File transfer is used when it is necessary to send files of various types: photos, audio and video files, documents etc. BYOD-friendly, users can join and host from multiple devices— PCs, handhelds and mobile, cell phones, smart phones. 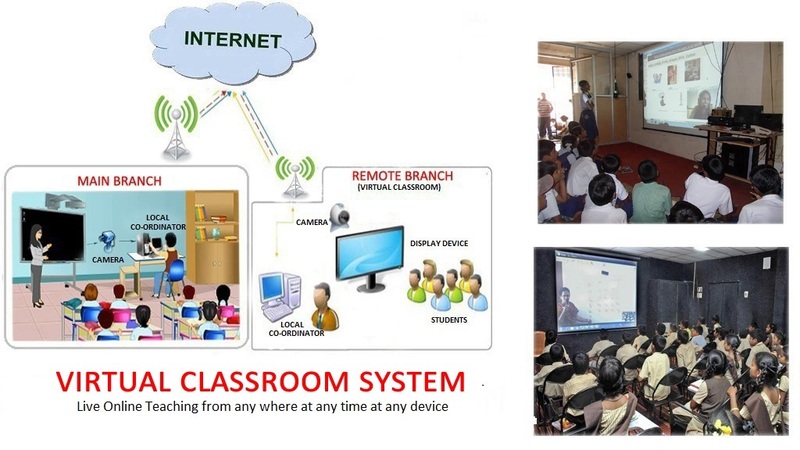 Virtual Classroom Solution allows the integration of multiple devices in a session. Dynamically adapts communication parameters. Transparent mode for the user. Upgrades or downgrades depending on CPU capacity, available bandwidth and network delay. Live feedback system is a state-of-the-art system used to gather the participants’ responses and create instant report to measure their performance. This system is widely used to create better interaction between instructor and audience. Streaming is good choice, when you want to avail your lecture/presentation to your consumers, who has the license to access the media files. The streaming files are protected by secure encrypted technique and cannot be copied without your permission. The solution offered is highly scalable and allows the upgrade of the system in an easy and transparent way. Interoperable with existing IT and communication environments. Participants can use the ‘raise hand’ feature to get the teacher’s attention to ask questions similar to hand-raising in the physical classroom. Real-time collaboration with screen sharing, whiteboarding, annotation, file transfer, recording, etc. You can have the ability to stream content, video, whiteboard and annotations from your PC/Mobile devices onto displays wirelessly. The online polling feature is a required in a virtual classroom to collect participants’ feedbacks. Integrated assessment system takes instant feedback from audience and generate the assessment reports in different formats. Allows to record the presentation, meetings, conferences, lectures, trainings and more with HD audio-video and data for later use, you can store the downloaded file on your PC in native file format or upload it to your company’s website. Supports crystal clear live audio streams over transmission protocol to reduce audio latency. High quality audio system is integrated with the our virtual system. Interoperable with existing IT and communication environments. We offer high quality audio-video conferencing for real-time media collaboration, communication and assessment. It is perfect for multi-site collaboration with up to 25 locations where users can join from anywhere, using any device – pc, mobile, room endpoints. "Never think there is anything impossible for the soul. It is the greatest heresy to think so. If there is sin, this is the only sin ? to say that you are weak, or others are weak."